If you’re a sucker for hand-baked bread and artisanal cheese and seasonal farm fare (and who isn’t?) you'll want to head over to Barnes & Noble in Westport this Sunday, May 6 at 11 a.m. for a book signing, foodie and children’s event in support of Westport's Wakeman Town Farm. Jason Sobocinski of New Haven's Caseus restaurant and host of “The Big Cheese” will join SoNo Bakery's John Barricelli, host of "Everyday Baking," to offer tastes and sign copies of their beautiful cookbooks, Caseus Fromagerie Bistro Cookbook and the SoNo Baking Company Cookbook as part of a Bookfair Fundraiser for Wakeman Farm. 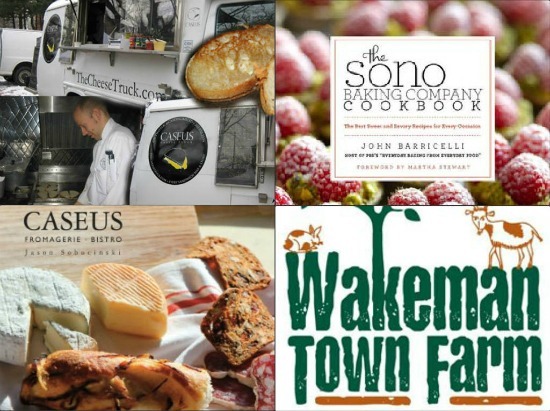 Not only will you get to meet the authors and peruse their new books, but Caseus is bringing its famed Cheese Truck to the event. The Cheese Truck is a mobile kitchen that drives the streets of New Haven selling to-die-for grilled cheese sandwiches, tomato soup, daily sausages, salads and more! Ditch the Sunday diner this Sunday and stop by Barnes & Noble to sample the incredibly addictive melted sandwiches (Pastrami and Grilled Onion or Chorizo and Melted Brie are two recent faves) from Caseus, the famed New Haven Fromagerie and Bistro, without having to make the schelp up I-95. Bookfair opens at 10 a.m., Book signing & Cheese Truck opens at 11 a.m.